Looking for your dream event planning job? Get inspiration from our event planner cover letter sample, and you’ll be landing more interviews before you know it! Not what you had in mind? Browse our full library of cover letter templates. 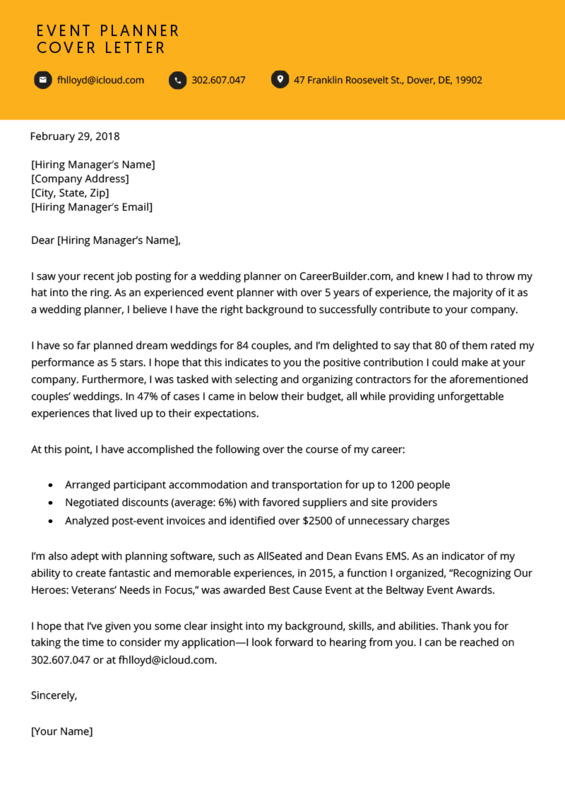 I saw your recent job posting for a wedding planner on CareerBuilder.com, and knew I had to throw my hat into the ring. As an experienced event planner with over 5 years of experience, the majority of it as a wedding planner, I believe I have the right background to successfully contribute to your company. I have so far planned dream weddings for 84 couples, and I’m delighted to say that 80 of them rated my performance as 5 stars. I hope that this indicates to you the positive contribution I could make at your company. Furthermore, I was tasked with selecting and organizing contractors for the aforementioned couples’ weddings. In 47% of cases I came in below their budget, all while providing unforgettable experiences that lived up to their expectations. I’m also adept with planning software, such as AllSeated and Dean Evans EMS. As an indicator of my ability to create fantastic and memorable experiences, in 2015, a function I organized, “Recognizing Our Heroes: Veterans’ Needs in Focus,” was awarded Best Cause Event at the Beltway Event Awards. I hope that I’ve given you some clear insight into my background, skills, and abilities. Thank you for taking the time to consider my application—I look forward to hearing from you. I can be reached on 302.607.047 or at fhlloyd@icloud.com.